Caught in the act! The man has since been sacked and the Pizza Hut shut down. There are hygiene standards and then there is this district manager for Pizza Hut. The antics of this district manager have left the Italian food chain red in the face and wet in the pants. 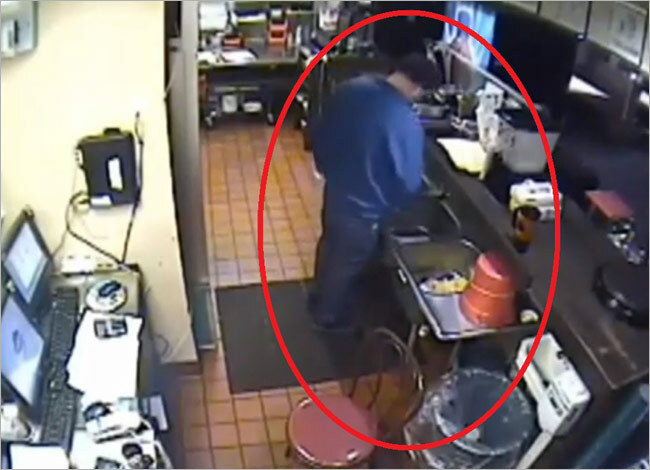 The man, reportedly a district manager, was caught on CCTV peeing into a sink apparently in the restaurant. The Kermit branch of Pizza Hut in West Virginia has since been shut down by the Mingo County health officials. In response to the embarrasing actions of its employee, Pizza Hut said that the man has been sacked and reiterated its “zero tolerance” policy to such matters in a statement. Meanwhile, community members have vowed never to eat at the restaurant again. The outlet is expected to reopen in a week or so.